Hey there everyone!! I am back tonight with another post for Lawn Fawn inspiration week. We are doing something a little special tonight, and reintroducing two sets called "Harvest Season" & "Heebie Jeebies". Although previously released, these are still current stamp sets and can be found in stores, as well as the Lawn Fawn website. I am on the list for "Harvest Season", which is probably one of my very favorite Thanksgiving themed stamp sets ever! I just adore the leaves that are included in it, and I love that the sentiment I chose can be used for any time of year...not just at Thanksgiving. I used Viva la Verve! August 2011 Sketch #4 to help with the design of my card. And I also used the Just Us Girls color challenge #98 (chocolate chip, deep yellow, riding hood red, olive green). This is what I came up with! Instructions: Make card from red cardstock. Cut brown scripted paper slightly smaller and adhere to the front. Cut a green damask square paper block and adhere. 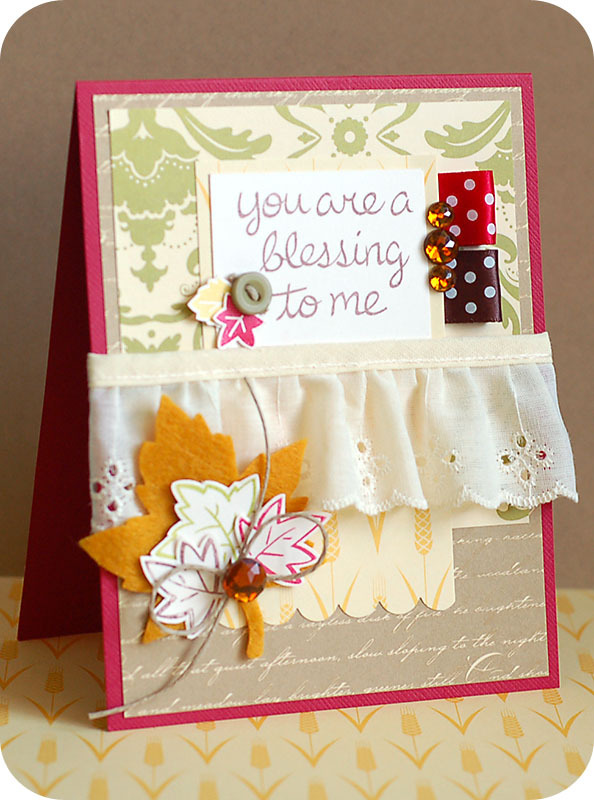 Cut a yellow paper strip, punch a scalloped border to the bottom and adhere. Make two ribbon tabs, and adhere them underneath the top right side of the yellow paper block. Accent the ribbon tabs with three brown jewels. Stamp the sentiment to a vintage cream cardstock block, and adhere to the top of the yellow strip. Wrap lace around the seam, and then adhere a felt leaf to the lower left corner. Stamp the large & small leaves to cardstock and cut out. Adhere the three larger leaves to the felt leaf. Tie a bow from twine, adhere to the leaf accent and then add a brown jewel to the middle of it. Adhere the two smaller stamped leaves to the left side of the sentiment, and then top them with a button & twine to finish. Win ALL nine new sets!! Super !!! Nice and interesting card! Oh Lea!!! This is FABULOUS!! Love the lace!!! What an awesome take on the colors! Thanks so much for playing along with Just Us Girls!!! Did you use regular felt? did you use a cuttlebug? This card totally took my breath away when I opened it up the first time. I love it, Lea! Just plain love it! I feel like I am peeking though the curtains of adorableness to gaze upon the striking beauty of your GORGEOUS creation, Lea! YOUR use of the JUGS colors has me all swoony!!! Thanks for making us a part of your great release work! Yee Haw! xoxo!